Water Hand Pumps Like the India Mark II Have Been Around For Years and Are Used Worldwide. The India Mark II Water Hand Pumps are conventional lever action hand pumps. The Mark II is a public domain pump and is manufactured and distributed by corporations worldwide. The Mark II hand pumps emerged in India through development of water hand pumps during the 1970's to the 1990's. There was a need for a hand pump that was more durable than those available at the time. Also, due to efforts of the Indian government to increase rural supplies of clean water, borehole well drilling was on the increase in India. There was a need for water hand pumps that fit the smaller well casings of borehole wells, that could be set in a concrete pad to create a sanitary seal. UNICEF partnered with the Indian government and private research and development firms to develop the India Mark II. The developmental focus of this partnership aimed at developing a sturdy and reliable hand pump that could be used by an entire community and not just one family. Large-scale local production was needed in low-cost, simply-equipped workshops, and the pump would have to be made of materials that were locally available. Developers of the India Mark II realized that it was important to build a pump that was easy for women and children to operate, since they were the primary water-gatherers for the community. The designers believed that a better-designed hand pump with standardized parts and good quality control would make the pumps more easily and effectively maintained. The Mark II became the state-of-the-art in water hand pumps and by 1998 there were 62 manufacturers with an annual production capacity of over 300,000 pumps. It soon became evident that more quality control was needed in the production of India Mark II pumps and pump parts. National standards were formulated and the quality of pump production became more important than quantity. Standardization and market forces led to lower prices and increased pump reliability and ease of maintenance. The Mark II is a closed-cylinder pump. The cylinder brass-lined cast iron with the foot valve and piston assemblies made of brass. The piston seals are double nitrile rubber cup seals. As you can see in the figure below, the top and bottom of the piston cylinder are “capped” with threaded reducers. The diameter of the pump cylinder is larger than the diameter of the riser main to which it is attached. Maintenance on any part of the pump cylinder requires that the riser main and the pump rod be removed from the ground. The pump rod is galvanized steel and sections are threaded together. The pump cylinder is threaded onto the last section of riser main and is removed in its entirety as the last component to come out of the ground. The pump cylinder can then be unscrewed from the riser main. The top and bottom caps can be unscrewed from the cylinder body to gain access to the foot valve, the piston valve, the piston seals and anything else inside the cylinder body. The Mark II water hand pumps are reliable and widely used. However, for installation and maintenance, tools and skills are required that may not be available at the village level. As such, the Mark II is not considered a VLOM pump. It usually requires a trained area technician to install and maintain a Mark II pump. The Mark II hand pump consists of the above-ground mechanism which includes the pump head, pump handle, water tank, and pump stand assemblies. 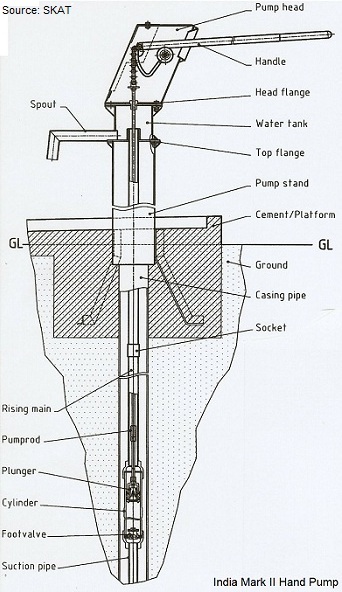 The below-ground mechanism includes the riser main, pump rods and pump cylinder assembly. The above-ground mechanism is constructed of welded steel plate for strength and is hot-dip galvanized for corrosion resistance. These parts may be locally manufactured. A chain and quadrant mechanism of the pump handle provides easy and accurate alignment of the connecting rod (see illustration). The pump handle has a high mechanical advantage. It is heavy and is designed to counter balance the weight of the connecting rods to reduce the pumping effort required from the user. The handle pivot assembly (sealed ball bearings on a stainless steel axle) makes operation easier and lowers maintenance needs. The pump rods are made of cold drawn bright steel bar with threaded end couplers, electro-galvanized against corrosion. Stainless steel rods are also available. The pump cylinder is made from a cast iron casing with a polished brass liner and gun metal plunger and check valve components. Seals (pump buckets, valve seals and cap seals) are available in environmentally safe Nitrile rubber. This pump can be easily adapted for shallow well, windmills and motorized operations with minor modifications. 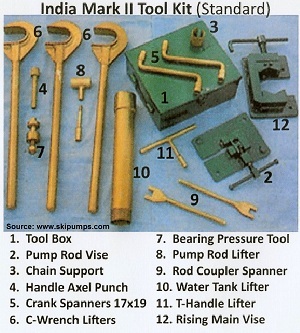 Below you will find a standard tool kit used for maintenance on India Mark II water hand pumps. The C-wrenches (#6) are used for manual lifting of the riser main when a block and tackle is not required. The riser main vise (#12) and the pump rod vise (#2) are used to clamp those components while installing or removing them, preventing them from falling into the well. Additional tools are also required such as pipe wrenches (1@18" and 2@24"), open-end wrenches (17mm and 19mm), and adjustable spanner, among others. Manuals for the India Mark. II hand pumps have been published by International Development Research Centre (IDRC) and private companies. 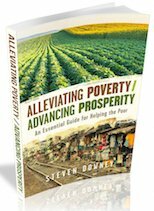 They are available as PDF files here. Return to Introduction to Hand Pumps" from "Water Hand Pumps"